Everything is bigger in Texas, or so they say. Fittingly enough, the UFC’s return to Texas this weekend will be headlined by two men fighting over the UFC Heavyweight title. Stipe Miocic will be making his second defence of the belt he won last May against Dos Santos, the man who inflicted the Cleveland-based heavyweight’s last professional defeat in December 2014. The fight was incredibly close, with many pundits scoring it in favour of Miocic, and both men have experienced different career trajectories since then, giving this rematch even more intrigue. That is not the only title match scheduled, however, as Joanna Jedrzejczyk will make the fifth defence of her Strawweight title against Jessica Andrade, who has been on fire since dropping down to the 115-pound division last year. History was set to be made at the event, as it was the first event since UFC 2 to feature 14 fights on one card, but a broken hand for Henry Cejudo bounced him from his bout against Sergio Pettis, before illness forced Jared Gordon out of his bout with Michael Quinones, leaving us with a 12-fight slate. That said, we have got some excellent bouts on tap, including the return of former two-division WSOF champion David Branch, an entertaining lightweight scrap between Eddie Alvarez and Dustin Poirier as well as Frankie Edgar and Demian Maia. Without further ado, here are my predictions for the evening’s action! Light Heavyweight – Joachim Christensen (14-4) vs Gadzhimurad Antigulov (19-4): Although this fight would feel more fitting on one of the UFC’s upcoming European fight cards, it’s still a solid fight in one of their weakest divisions. Christensen managed to get his first UFC last time out against Bojan Mihaljovic but I’m still not sold on him as a top-level talent. Antigulov, however, is on a 13-fight winning streak that I cannot see that ending here. Prediction: Antigulov via first-round submission. Featherweight – Gabriel Benitez (19-5) vs Enrique Barzola (12-3-1): I was impressed by Benitez’s performance against Sam Sicilia, where he utilised leg kicks and impressive counter-striking before securing a submission win. A similar strategy could work against Peru’s Barzola, but I personally think the Peruvian is on a different level. The way he prepared for his fight with Chris Avila (grantedly a much easier opponent) shows a determination possessed by very few and he has very good takedowns. Benitez will have moments, but they’ll be few and far between. Prediction: Barzola via UD. Women’s Strawweight – #12 Jessica Aguilar (19-5) vs Cortney Casey (6-4): A torn ACL kept Aguilar out of action last year, meaning this is her first fight in 21 months and just her second UFC appearance. I’m glad to see her back in a fight where I think she can shine. Casey is unorthodox and wily, as Claudia Gadelha would undoubtedly attest, but Aguilar is still one of the very best at 115. Expect her to mix up her striking and land regular takedowns to secure a clear but entertaining decision. Prediction: Aguilar via UD. Lightweight – Marco Polo Reyes (7-3) vs James Vick (10-1): Injuries have prevented Vick from developing into the star many thought he would be but this is a good fight. Reyes embodies that classic Latino fighting spirit, reckless forward motion combined with power and durability – his bout with Dong Hyun Kim was one of 2016’s best. Reyes is 3-0 in the UFC but I foresee that streak ending here. Vick has a sizeable height and reach advantage and is also more skilful. As such I expect him to work his jab and land consistently, before capitalising on some desperation from the Mexican late on to secure a submission victory. Prediction: Vick via third-round submission. Heavyweight – Chase Sherman (9-3) vs Rashad Coulter (8-1): Boy, do I like this fight more than the original fight booked. The debut of Dmitry Poberezhets piqued my interest but I have no desire to ever see Jarjis Danho fight again. Thankfully both withdrew and we’ve instead got the debut of Rashad Coulter. Coulter looks decent, possessing heavy hands, but I’m dubious. From the tape I’ve seen he appears to be quite flat-footed and in his career he’s fought as low as 187 pounds and as high as 246 which is concerning. I’m also not convinced by his level of competition – the cumulative record of his beaten opponents is 28-51. Sherman is chinny but he appears better-rounded than Coulter and I think his sizeable height advantage will be a key factor. They have 17 KO wins between them, expect that to go up before the night’s out. Prediction: Sherman via first-round KO. Featherweight – Chas Skelly (17-2) vs Jason Knight (17-2): On the UFC’s most stacked card in 2017, this is my dark horse for Fight of the Night. The only blemishes on either man’s record have been against suffocating grapplers and thankfully neither fit that bill. Both men work at 100mph and there’s very little between them. Skelly is the larger man and will likely come out of the blocks faster and could sneak an early finish, but he’s also demonstrated a questionable gas tank previously and therefore you’d have to favour Knight if this goes the distance. With absolutely no convinction, I’m backing Skelly to win a barnburner. Prediction: Skelly via second-round submission. Lightweight – #3 Eddie Alvarez (28-5) vs #9 Dustin Poirier (21-5): That this is the featured prelim tells you all you need to know about this card. This is Alvarez’s first fight since Conor McGregor made an example of him in New York and it’s hard to know how he’ll look. That fight wasn’t a good indication of the former champ’s skills and his previous defeats have resulted in big improvements. 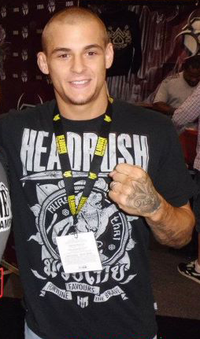 Poirier is coming off an excellent win over Jim Miller and has looked excellent since moving up to lightweight. Alvarez plans for fights so well and you’d have to think he’ll look to cut the cage off and grind Poirier much akin to the way he ground out Anthony Pettis. That said, Poirier has better takedown defence than Pettis and I think this could be his breakthrough fight. Prediction: Poirier via split decision. Middleweight – #9 Krzystof Jotko (19-1) vs David Branch (20-3): I feel for Jotko, as his 6-1 run has rarely been mentioned in the build-up – it’s all been about Branch’s UFC return. Released in 2011, Branch has gone 12-1 since then and won WSOF belts at 185 and 205. Both men possess good grappling and Jotko’s last fight against Thales Leites opened a lot of eyes. Jotko is a prodigious talent and I’ve been caught out by picking against him previosly, but I think Branch is at his peak and will secure a big win. He won’t finish the Pole, but he’ll make a statement. Prediction: Branch via UD. Featherweight – #2 Frankie Edgar (21-5-1) vs #7 Yair Rodriguez (10-1): Sometimes a fight will come together and everything just feels right. In Rodriguez the UFC has a potential new star – he has the look, the fighting style and most importantly the right background and a win against Edgar, an all-time great, makes his case for a title shot impossible to ignore. Edgar, the former lightweight champ and two-time featherweight title challenger, is one of the toughest guys in the UFC and his relentless pace on the feet and excellent wrestling makes him a threat against anyone, especially someone like Rodriguez. Jose Aldo has laid the blueprint for beating Edgar but Rodriguez doesn’t have the same power or takedown defence to pull it off, meaning he’ll be on the receiving end of numerous takedowns. Prediction: Edgar via UD. Weltweight – #3 Demian Maia (24-6) vs #5 Jorge Masvidal (32-11): Easily the evening’s most compelling bout. Maia has been on an absolute tear, winning six straight in incredibly dominant fashion, and really should have already had a crack at Tyron Woodley. Masvidal, meanwhile, has been sent in to play spoiler by the UFC, having already stunned fans with his TKO win over Donald Cerrone in January. Masvidal is scrappy and has impressive takedown defence – if he can stay upright he has a massive advantage. However, Maia has been the man with the Midas touch recently and I just can’t pick against him. Prediction: Maia via second-round submission. Women’s Strawweight: (C) Joanna Jedrzejczyk (13-0) vs #3 Jessica Andrade (16-5): One of the hardest bouts to pick on the entire card. Andrade has looked like a beast since dropping down from bantamweight and on paper she presents the biggest challenge to Joanna Champion’s reign. The Pole has excellent striking but she hasn’t got scary power and has often had to rely on out-techniquing her opponents (i.e. her second bout with Gadelha and against Letourneau). Andrade is the smaller fighter but she constantly moves forward, throwing heavy leather and mixing in excellent takedowns. If she is able to cut the cage off and back Joanna up, we could see a new champion crowned. Andrade is essentially a more complete version of Claudia Gadelha, who pushed the champ the furthest of anyone, and she has a great chance but something niggling at the back of my mind favours the champion. Prediction: Jedrzejczyk via split decision. Heavyweight – (C) Stipe Miocic (16-2) vs #4 Junior Dos Santos (18-4): A rematch of one of the best heavyweight matches in recent years to cap off the UFC’s most stacked card of 2017. Their first fight in 2014 was exceptionally close and although I had JDS narrowly winning, Miocic had a compelling case for the win. Both men pack incredible power and JDS is one of my favourite fighters but I think this match-up favours Miocic. That defeat led him to make major improvements in his game and he has been considerably more active than JDS, who has fought just twice since their initial meeting. It could just come down to who lands the first big shot but I think it goes deep, with Stipe falling back on his wrestling at times, before the champ retains through a ground-and-pound stoppage. Prediction: Miocic via fourth-round TKO.